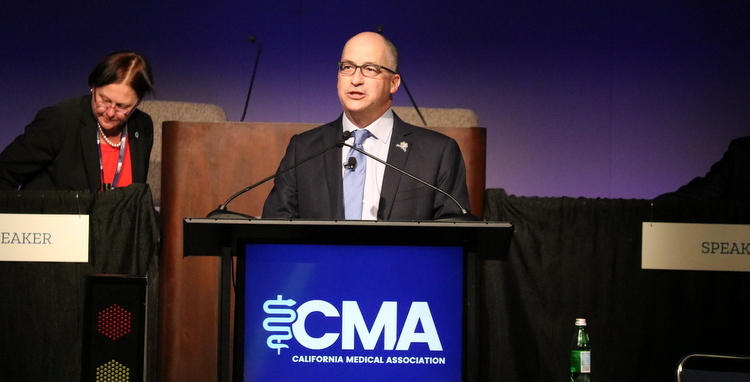 The California Medical Association (CMA) installed Los Angeles ophthalmologist David Aizuss, M.D., as its 151st president during the organization’s annual House of Delegates (HOD) meeting this weekend in Sacramento. In his address to the delegates, Dr. Aizuss said that physician satisfaction and practice sustainability would be among his top priorities in the upcoming year. Dr. Aizuss will officially take the reins at the close of this year’s annual meeting and will serve a term of one year as CMA president. Dr. Aizuss has been a CMA and Los Angeles County Medical Association (LACMA) member for 37 years. He has been a member of the CMA Board of Trustees since 2010—serving as vice-chair and chair of the board before being named president-elect at last year’s HOD. Dr. Aizuss has also represented the physicians of California as a delegate to the American Medical Association (AMA), and is currently serving on the AMA Council on Legislation. Dr. Aizuss is a former president of LACMA and the California Academy of Eye Physicians and Surgeons. Through the David H. Aizuss, M.D., Medical Corporation, and the Ophthalmology Associates of the Valley Medical Surgical Group, a partnership of medical corporations, Dr. Aizuss focuses exclusively on direct patient care. He is a medical staff member at Tarzana Hospital and West Hills Hospital, in Los Angeles County and serves as an assistant clinical professor of ophthalmology at the UCLA Geffen School of Medicine. He received his medical degree from Northwestern University Medical School and completed his residency and fellowship in ophthalmology at the Jules Stein Eye Institute in Los Angeles.